The Woodlands Town Center is what’s known locally as the “downtown” of The Woodlands, Texas. Built to resemble a small city in the heart of a vastly residential area, Town Center is the place to go for all your shopping, dining, and entertainment needs. You will find townhomes, condominiums, hotels, and business services here as well. Hosting over 20 million visitors annually, Town Center boasts a large Town Green Park that hosts many events throughout the year. Tasting the Town in January, The Woodlands Waterway Arts Festival in May, the Red, Hot & Blue Festival in July, and the Lighting of the Doves in December are among the fun activities planned. Town Center is located adjacent to The Woodlands Mall, which houses over 200 shops, and the Cynthia Woods Mitchell Pavilion, home to outdoor concerts and events year round. Since it is situated on 1,000 acres of land, it is a long way from end to end – enter the Water Taxi for a convenient, fun way to get around. The river along Town Center’s southern border is called The Woodlands Waterway and is a beautiful place to take a stroll along side its banks, or you can rent a kayak from the Riva Row Boat House. 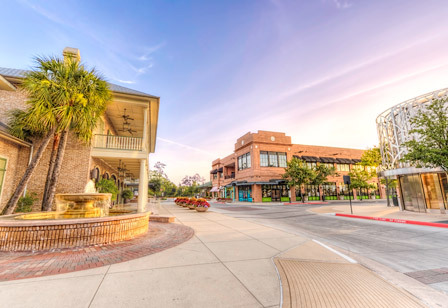 Also located within The Woodlands Town Center is the locally famous Market Street, an outdoor mall with many specialty shops and boutiques, casual and upscale restaurants, coffee shops, and small businesses. The Woodlands Marriott Hotel & Convention Center is a great venue for corporate events and tradeshows, but also makes for a nice, relaxing place to stay after a long night of partying and dancing at a concert at Cynthia Woods Mitchell Pavilion. So spend the day at The Woodlands Town Center where you will find something fun for everyone in the family. And don’t forget to cap off your evening with a visit to the plaza and waterfall area where you’ll find choreographed fountains with colored lighting and music during evening hours.